By NNA Staff on December 28, 2010 - Conference 2011 is themed “Managing Risks In Today’s World” — but those risks affect not only Notaries but their bosses, too. By NNA Staff on December 28, 2010 - Kris Kobach, a key architect of Arizona’s strict anti-illegal immigration law, has been elected Kansas Secretary of State, and will oversee the state’s Notaries and elections, among other duties. By NNA Staff on December 28, 2010 - Communicating directly with a signer is essential, but that's a challenge with people who are hearing- or speech-impaired. Find out how to bridge the communication gap! By NNA Staff on December 28, 2010 - A “living will” is a written statement of a signer’s wishes regarding medical treatment in the event the signer is incapacitated and unable to give instructions. By NNA Staff on December 28, 2010 - Mortgage fraud has jumped 20 percent in the past year, largely fueled by increased lending through federal refinancing programs. By NNA Staff on December 28, 2010 - Mexican consular IDs are fine for police, but North Carolina Notaries still can’t use them to identify signers. 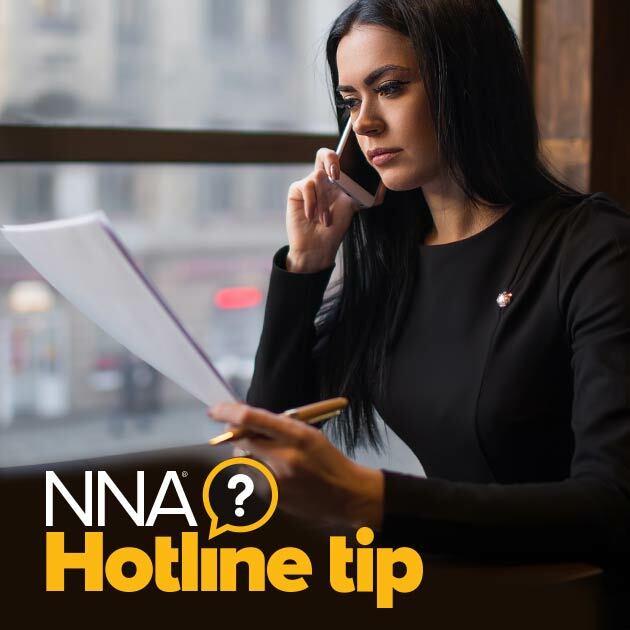 By NNA Staff on December 28, 2010 - The following are important practices for all Notaries to follow as they serve the public. By NNA Staff on December 28, 2010 - Two upstate New York Notaries were dropped from a federal racketeering lawsuit after proving to the plaintiffs’ attorney that they were innocent pawns used by members of the so-called “sovereign citizens” movement. By NNA Staff on December 28, 2010 - We sincerely thank you for your support of the National Notary Foundation. By NNA Staff on December 08, 2010 - While people commonly associate notarization with real estate transactions, nearly three-fourths of all signed and sealed documents involve other transactions and industries, according to respondents to the November poll featured in the Notary Bulletin.